Growth or value? It is an age-old question, like chocolate or vanilla. But why has growth investing been trouncing value over the past decade? It is likely investors' preference for growth is not about shifting tastes or the result of short-term factors, but rather is due to secular changes in the economy and a flaw in one of the main ingredients in the flavor of value investing. 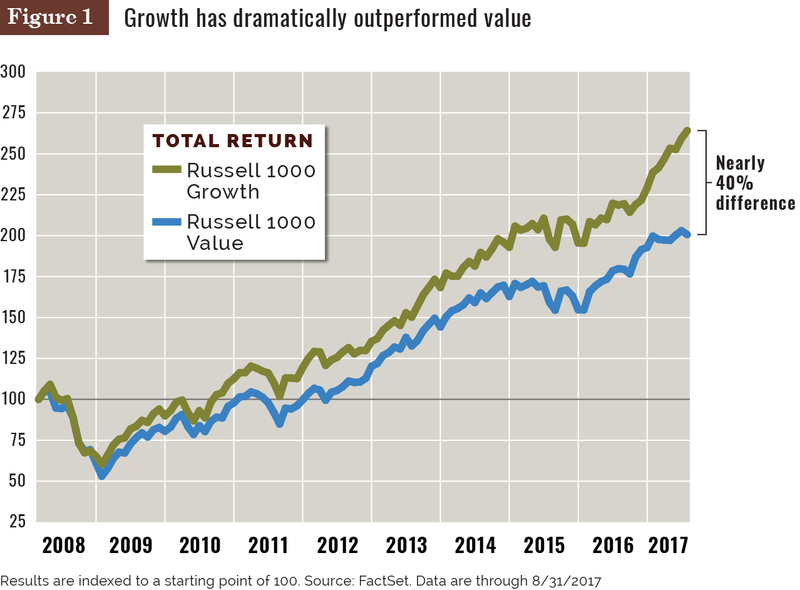 Over the past decade, the Russell 1000 Growth index has returned about 40% more than the Russell 1000 Value index. 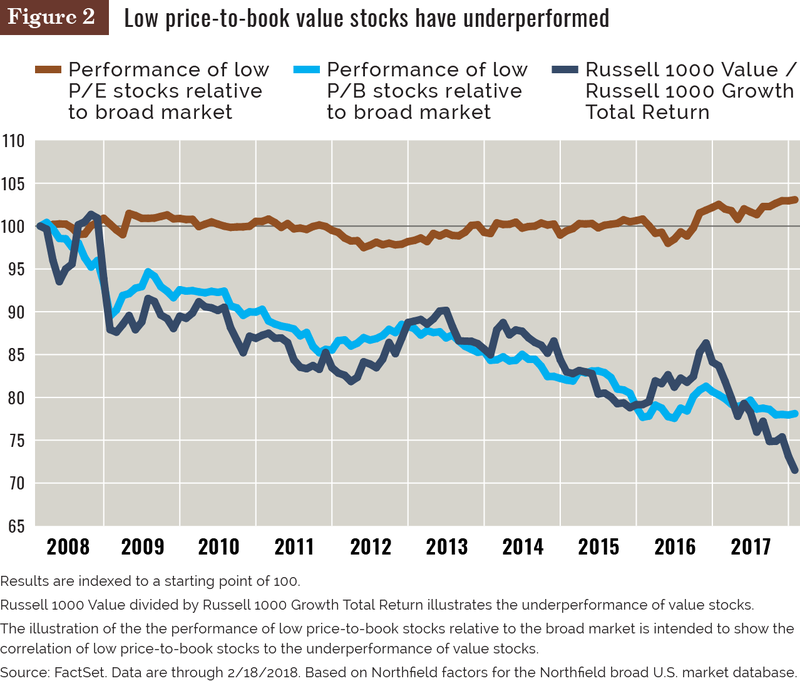 The single biggest contributor to that gap is the weak performance of low price-to-book stocks, even after eliminating the impact of the underperformance of financial companies in the value category. This driver of equity performance is critical because trillions of dollars are indexed to style benchmarks like the Russell value and growth indexes, where classification is determined in large part by price-to-book value. 3.	acceleration in the development and adoption of innovation. The underperformance of value stocks can be explained, in part, by a combination of corporations' increased reliance on intangible assets, accounting standards that fail to reflect those changing business models, and the overdependence on one particular metric for style classification (price-to-book value). Today, many businesses use fewer tangible assets such as plants and equipment than in the past, and they are increasingly reliant on intangible resources including research and development, advertising, marketing and training. Accounting professors Baruch Lev and Feng Gu observed in "The End of Accounting" (John Wiley & Sons, 2016) that over the past 40 years, the investment rate in physical capital fell by 35% while the investment rate in intangible assets grew by almost 60%. In short, accounting practices haven't kept up with the evolving economy. Spending on intangible assets is generally not capitalized in current accounting standards and therefore is not included in book value, rendering the price-to-book value metric less effective. Without including the full value of intangible assets on their balance sheets, new economy companies are more likely to have high market values relative to their book values and therefore be classified as growth companies. By relying heavily on price-to-book value rather than other methods of valuation such as price-to-earnings, style classification is increasingly separating companies based on business models rather than "value." That has led to a bifurcation in returns as low price-to-book equities have underperformed not just the broad market, but other value equities such as those with low price-to-earnings. 1. It has disproportionately hurt value stocks, such as industrial or commodity companies that tend to be more cyclical in nature than growth companies. 2. Slower economic growth and inflation have driven down interest rates, which has hurt the performance of financial companies that have a higher weighting in the value indexes. The divergence in growth and value also is being driven by technological advances that are expanding at an exponential rate, which means the rate of change is accelerating. This acceleration is apparent most famously in Moore's law, which explains the rate of improvement in transistors, but we also see it in information storage (e.g., hard drives), information transportation (e.g., fiber-optic cables), wireless telecommunications, energy and even illumination. The increasing pace of change means innovations are spreading through society faster. Older innovations such as the dishwasher and washing machine took many decades to reach 50% penetration of the U.S. market; more recent innovations such as the internet and social media took 14 years and nine years, respectively. In a world where change is happening more rapidly, value stocks that appear cheap may more often simply be victims of change while growth stocks may benefit as purveyors of change. The definitions of growth vs. value and accounting standards need to evolve with the economy because change is rapidly accelerating in step with innovation. We believe investors reflexively using standard — but increasingly outdated — valuation measures to invest are at risk of missing attractive equity opportunities that arise from positive fundamental changes due to innovation. These deep-rooted issues may mean investors' taste for growth over value might be less about the flavor of the moment and more based on economic realities that will endure for the foreseeable future. Brad Neuman is a senior vice president with Alger, New York. This content represents the views of the author. It was submitted and edited under P&I guidelines, but is not a product of P&I's editorial team.